So there was this train derailment not far from here yesterday, that dumped train cars all over the main north-south freeway for the West coast; it killed three passengers. The train was going 80 miles an hour as it went into a curve, where the speed limit was 30. The revelation that a passenger train was speeding 50 miles per hour over the speed limit at the time of a fatal crash near Tacoma, Wash., has once again focused attention on Amtrak’s safety culture, the role of human error in rail accidents, and the need for technology that automatically slows trains that are going too fast. Late Monday night, National Transportation Safety Board officials said that the train, bound from Seattle to Portland, Ore., was traveling at 80 miles per hour, on a curve with a limit of 30 miles per hour, when it jumped the tracks and careened into a busy highway and a stand of evergreens. At least three people were killed and about 100 were injured, officials said. Yesterday afternoon, before the NTSB confirmation, it was already being reported that the train had apparently been going 80. News outlets also published the audio of the engineer’s call to emergency services, so we could hear him say “we were approaching the curve and then we were on the ground”…as if there were something surprising about that when the train was going 80. You don’t have to be a professional to know that trains can’t go 80 on curves, because they’re not agile enough. The accident mirrored Amtrak’s worst disaster in recent years, in 2015, when a train derailed at more than 100 miles per hour in Philadelphia, on a curve posted at 50 miles per hour, killing eight people. 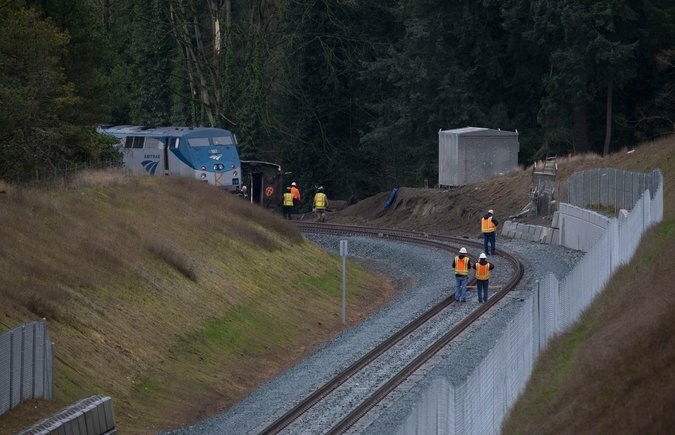 Train 501, carrying 77 passengers and seven crew members, derailed Monday morning, between Tacoma and Olympia, on the inaugural run of a new route for Amtrak’s Cascades service, where the tracks curve onto an overpass crossing Interstate 5. It was not clear how familiar the engineer was with that stretch of track, or whether that played a role in the crash. Well oops. Wouldn’t you kind of hope all that would have been considered beforehand? “Oh, hey, new track, had we better maybe make sure the engineer knows where the curves are and knows to slow down when approaching them?” Do they not plan for these things? Apparently not as much as they should. Just last month, the N.T.S.B. reported that Amtrak had a “weak safety culture”. That conclusion stemmed from an investigation into a 2016 accident in Chester, Penn., that killed two track workers. Federal law requires railroads, by the end of 2018, to have positive train control, which automatically slows trains if they are exceeding speed limits or approaching dangerous conditions. In its latest progress report to the railroad administration, Amtrak said it had installed positive train control on all 603 miles of track on the Northeast Corridor, from Washington to Boston. Congress passed the law requiring positive train control in 2008, after the head-on collision of a commuter train and a freight train in Los Angeles killed 25 people. Railroads were supposed to have the system in place by 2015, but it became clear that many of them would not meet that deadline, the industry lobbied for more time, and Congress postponed the requirement by three years. The Times includes a photo of the curve. I wouldn’t even call it a curve, it’s a damn corner. The National Transportation Safety Board determined Tuesday the April 3, 2016, derailment of Amtrak train 89 near Chester, Pennsylvania was caused by deficient safety management across many levels of Amtrak and the resultant lack of a clear, consistent and accepted vision for safety. Also: Procedural error. Supervisory error. Fiduciary loss of control. This line used to be a slow freight line. Quite why it had to take that odd jag to the left to cross I-5 is not clear but may have a geological reason. Regardless, this is a line not built for high-speed commuter traffic but instead resignaled for that purpose. This is not an uncommon thing to do, but extensive testing is required to ensure not only that the signs and signals are appropriately placed and working, but that the drivers have become familiar with the route. 1. The engineer was just unfamiliar with the route and was not paying close enough attention to notice the speed restriction signs that he (in theory) should have passed about 3 miles from the curve. 2. The engineer fell into a kind of “highway hypnosis” type scenario where he’s driving along a straight, boring route and his brain switched off. 3. The speed restriction signs were either absent, difficult to see or incorrectly placed. My expectation based on the limited information available is scenario 2, because there appears at this stage to be no evidence that the brakes were applied. Train engineers know the capabilities of their engines, and seeing a curve like that I would expect them to brake and at least attempt to slow the locomotive down. There is alas a long and storied history of these kinds of accidents, which is why automated systems to sound alerts inside the driver’s cab (that have to be cancelled manually, see TPWS) or even override the driver and apply the brakes automatically (ATP in the UK, PTC in the US) were invented. Unfortunately in this case, although the system has been installed, it was not yet operational. The NTSB will do their job and eventually write a report that I guarantee you will say that PTC could have prevented this accident if it had been operational at the time of the crash and will recommend that installation of PTC across the entire network should be a priority. And I also predict that this will be ignored. This accident is eerily similar to the Santiago de Compostela derailment, where a train driver suffered a momentary lapse in concentration and entered a sharp curve at more than twice the posted speed. That accident killed a lot of people and the driver was prosecuted for 79 counts of homicide by professional recklessness. Personally I’m not convinced of the value of that unless you can prove some kind of criminal negligence such as being intoxicated. Drivers are human and they will make mistakes, which is why automated systems to counteract human failure should be prioritized over pointing fingers and assigning blame. Claire, agreed — it serves little purpose to punish one operator and leave the structural faults be. Kick the CEO / President in gaol, some actual results may occur. “Pour encourager les autres”? Not much help for the dead, survivors and maimed. This time. So, fix the system already. Yes. My “human error” in the last sentence was meant to apply to everyone, not just the engineer.